UPDATE: In Moto3 Hiroki Ono and Jorge Martin both receive three place grid demotions for dangerous riding, while Jakub Kornfeil starts last for a technical infringement. Both Moto3 and Moto2 look to have their championship winners sorted out and while Johann Zarco seems capable of turning things up a notch in Moto2 to stay ahead, Enea Bastianini looks ready for one final lunge to stop Danny Kent, made all the harder after his fall at Silverstone as Kent took the spoils. Enea Bastianini racked up pole number three for the season with a great late lap seeing him hit pole despite nearly hitting Jorge Martin. The Gresini rider set a storming lap of 1m 42.486 on his Honda beating all-comers despite his traffic troubles. Behind him Brad Binder secured his first front row start and was the top KTM rider with championship leader, Leopard’s Danny Kent, needing a last minute fast lap to propel him up to third, as he aims to move closer to the Moto3 title. His late dash knocked Niccolo Antonelli into fourth for Ongetta-Rivacold as he continues a strong second half to the season. The Italian is joined on row two by fellow countryman Romano Fenati, the Sky team racer another rider finding late improvement. The final spot on row two went to early session leader, Red Bull KTM Ajo’s Miguel Oliveira. John Mcphee could only manage 26thfor SaxoPrint-RTG, and was behind his team-mate Masbou who took the 13th grid spot. There were also a fall for Andrea Locatelli. Wild-card Adrian Gyutai starts 33rd. Alex Rins looked to have Moto2’s pole position all sewn up, reducing the lap record repeatedly as he controlled the session. They are joined on the front row by reigning champion Tito Rabat, with all the other riders unable to break the 1m 37s barrier. Simone Corsi starts from fourth for Forward Racing. He is joined on row two by Dominique Aegerter – who has looked at ease around Misano on his Technomag Racing Interwetten all weekend – in fifth and Hafizh Syahrin with a career best qualifying performance in sixth. Sam Lowes went back to his old settings and had his best lap cancelled on his way to seventh for Speed Up. He is joined on row three by Taka Nakagami for Idemitsu in eighth and Jonas Folger (AGR Team) in ninth. Julian Simon (Italtrans) completes the ten fastest times. There were crashes for Xavier Simeon, Alex Marquez Axel Pons and Ricky Cardus. Xavi Vierge lost his Tech3 which then crossed the track twice. 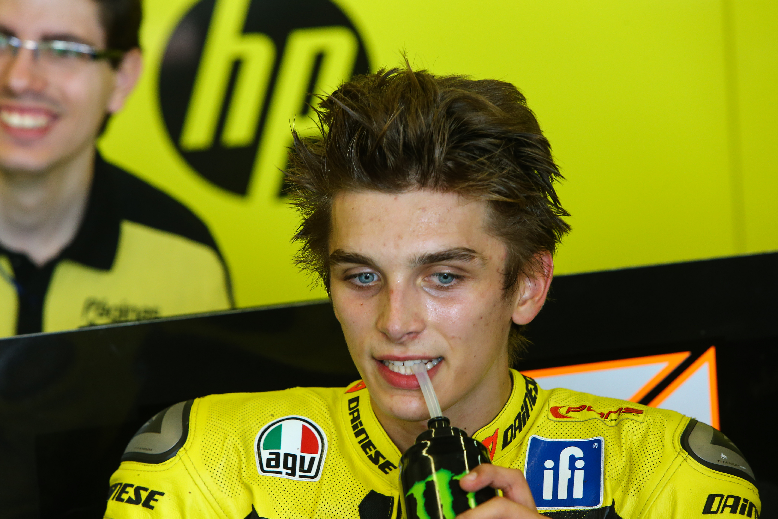 Valentino Rossi’s half brother Luca Marini has a wild card and starts 26th two places ahead in 24th is fellow wild card rider Mattia Pasini. Next Next post: Moto3 and Moto2 : Misano – Go big or go home – big performances from Bastianini and Zarco bring wins.